Robert Labelle, Loreen Toutan, Henry Barkwell. 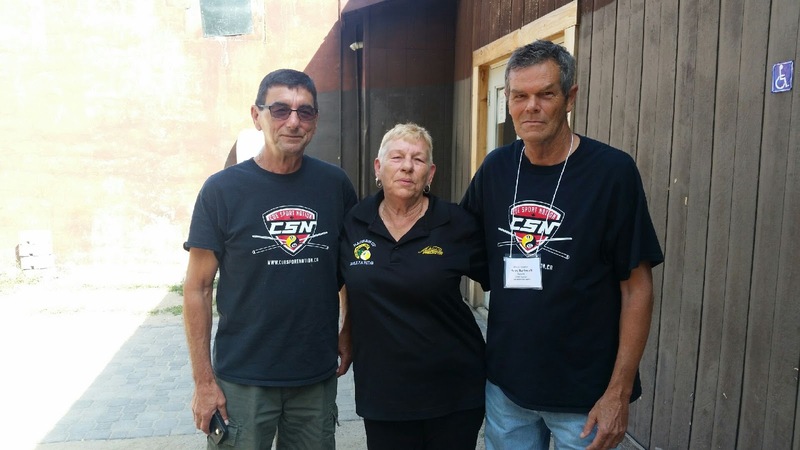 Last week August 9-11 three regulars from my home room of Rack-M-Up Billiards located in Cornwall Ontario, traveled to Midland Ontario, to participate in the Ontario Senior Games. This event was organized by the Ontario Senior Games Association which boasts over 1000 members and host qualifiers all the over the province. On April 29 2016, Rack-M-Up Billiards hosted a regional qualifier. Three of its regulars got the nod to participate in the Ontario 55+ Provincial Summer Games. The three qualifiers were Loreen Toutant, Henry Barkwell and Robert Labelle. Once they arrived in Midland there was an opening ceremony feast and then it was time to get into the round robin. Toutant was in the Women's 8 ball division, Labelle was in the Men's 8 Ball and Barkwell was in the Men's Snooker division. All three survived the round robin and had a chance at a medal. Robert Labelle who has very limited 8 Ball experience especially on Valley Bar Box tables which they were playing on, struggled and did not make the the top 3. Barkwell one of the most enthusiastic snooker players at Rack-M-Up who I believe never competed in anything like this previously took home the bronze. Toutant who could have been considered a "team captain" of sorts because of all her experience in playing tournaments all around North America came away a big winner. Toutant who only lost one match the entire event was able to capture the Gold Medal in convincing fashion. Thanks Markus .. Great article! Gold plugs for Rack-M-Up Billiards and the seniors games. Next summer games for Ontario and also Canada games is 2018. It was a blast! Looking forward to the next ones!